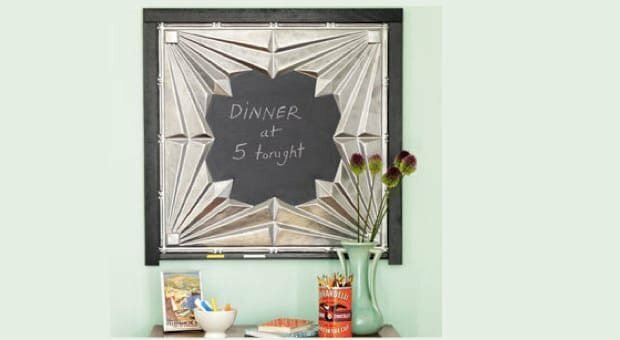 Tin ceiling tile magnetic chalkboards are so easy to DIY. All you need to do is choose a tile with a large flat center and paint the center with chalkboard paint . 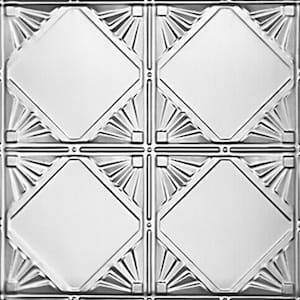 Although the picture shows the tile framed in black, personally, I think the frame detracts from the tile. I would just hang the tile directly on the wall with removable Picture-Hanging Strips or nail them into the wall with cone head nails. After reading about this project on Ceiling Tile Ideas, we decided to try it ourselves. A few years back, we were in the throes of a fairly significant home remodel project and needed “art” for the walls but our budget was pretty near depleted. And then I had an aha moment. Tin ceiling tile magnetic chalkboards would not only serve as wall art but they could solve the problem presented by replacing our old refrigerator with a gorgeous new stainless steel model. But for those of you who have not yet made the switch, the issue with stainless steel refrigerators is they are not magnetic. So now we had no place to hang our invitations, the kids’ art projects and all the other little things that traditionally cluttered our refrigerator doors. So we took the plunge! 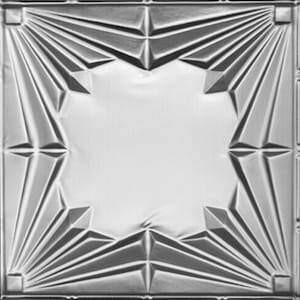 I called Milan over at Decorative Ceiling Tiles to see if he had 2 tin tiles with large flat spaces and coordinating styles. We chatted a bit and together decided that the Checkered Deco Style and Opening Act tiles both had a classic art deco vibe with lines that mirrored one another. 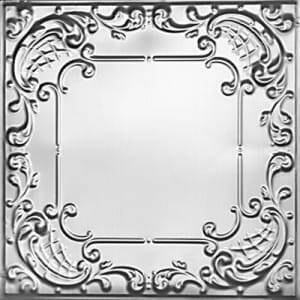 Milan also reminded me that if I wanted to create a magnet board, I would need an unfinished tin plated tile rather than the standard aluminum tiles since they won’t hold a magnet. A week or so later, the tiles arrived in large flat boxes, packed beautifully so they would not bend or crease. My next step was to pick up some black chalkboard paint, chalk, painters tape, and fun magnets. Warning: be sure to take your time masking the tiles. I am a bit impatient and ended up spending more time meticulously removing paint from the tiles than I spent initially taping. I could have avoided this annoying step if I was just more careful in my prep. 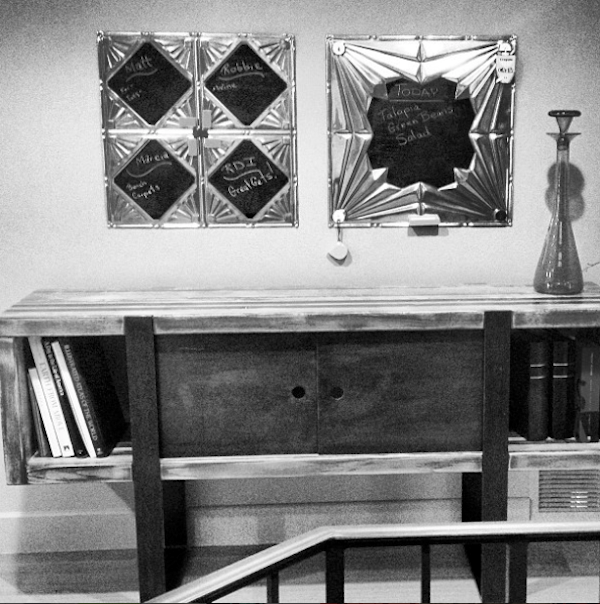 When I finally completed all the painting, I initially hung my new tin ceiling tile magnetic chalkboards above this industrial modern sidebar created by seventeen20. I few months later, we decided to move them to over the built in desk in the family room and that is where they still live today. As you can see we bought a whole bunch of magnets, a magnetic chalkboard eraser, and even decided to hang a small pack of chalk from magnetic hooks. I love the way our tin ceiling tile magnetic chalkboards turned out and best yet, the whole family takes advantage of the chalkboards to leave each other reminders and make one another smile. 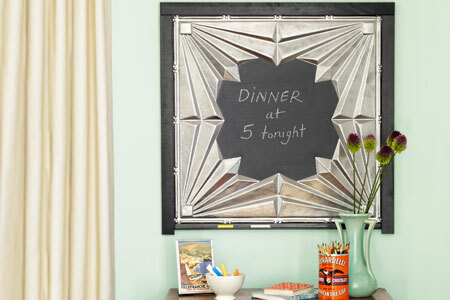 Summary: Create DIY magnetic chalkboard with tin ceiling tiles. 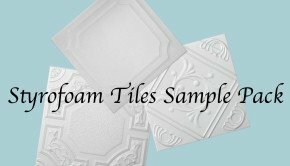 Perfect for industrial modern decor, vintage decor, country decor, kids rooms, restaurant menu boards, and coffee house decor.